That's it, you read it right! "The Super Awesome Micro Project" as the authors call it - a full sized and working car made with LEGO bricks, with an engine also made with LEGO elements that runs on air. It is the brainchild of a Melbourne entrepreneur Steve Sammartino and Raul Oaida, a teenage from Romania who Steve met on the internet. The engine is made from standard LEGO pieces and runs on air! More than 500,000 LEGO pieces used. It's a Hot Rod design, mainly because hot rods are cool. There are amazing examples of small car models made with LEGO and we already knew there are no limits to what one can build with LEGO, but this is just awesome! 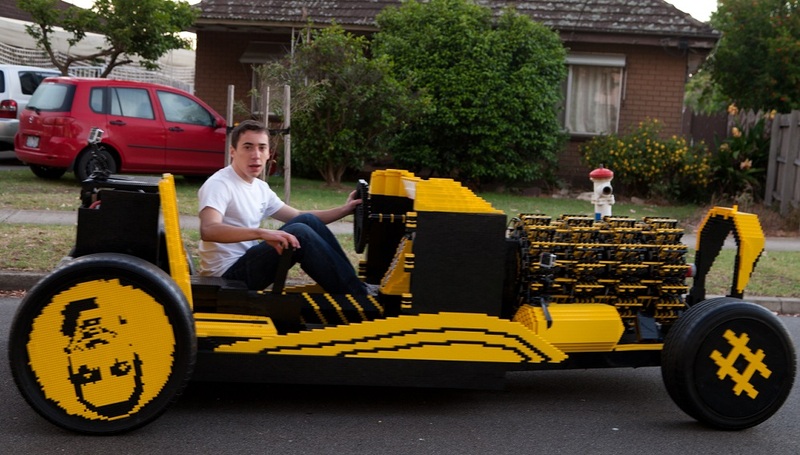 The car is entirely made of LEGO with the exception of the tires and a few bearings in the axles. To make it move there is an engine powered by compressed air, much like many small LEGO Pneumatic Engines (LPE) we already saw many examples here. However in this case, the air moves four LEGO motors with 64 cylinders each. The advantage is that in case of accident one just need to reassemble the broken sections, enter the car and move on. It's not too late to ask Santa to place one of these in your driveway! I have no words that can describe this awesomeness, it awestupenfantascular!!!!!
" with the exception of the tires and a few bearings in the axles"
The engine is impressive but as you can see at 1:33 it is also attached to that giant red non-lego axle. I acknowledge this is not a 100% accurate statement. Although I've not seen it written myself, I also believed there might be at least a supporting metal structure. Nevertheless main idea was to emphasize the huge model and unusual percentage of LEGO in this car as well as the functions where it is utilized.